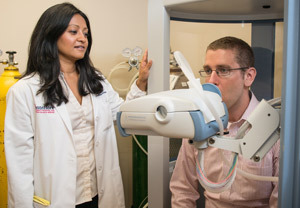 Our specially-trained team provides a carefully designed evaluation and customized treatment program for treatment of asthma, sinusitis and rhinitis all at a single location. We also cover a state-of-the-art inpatient unit at The Children's Hospital at Montefiore (CHAM) with an on-site school and a teen-friendly Child Life Program. All of the world-class subspecialists at CHAM consult for hospitalized children who suffer from Asthma. Resources, expertise and guidance to help our patients better understand, manage and control their conditions. A collaborative approach to treatment. Patients respond best when they receive treatment from a specialist, or through a specialist working in conjunction with a primary care doctor, because of the more focused treatment plan. We communicate the care plan to the primary care provider to eliminate or reduce visits to the emergency room and the need for corticosteroids as a method to control asthma symptoms. Our partnership with Albert Einstein College of Medicine allows us to conduct cutting-edge research in asthma diagnosis and treatment. To continually enhance our expertise and quality of care, we remain involved in a number of clinical trials looking at new asthma and allergy drugs. Their clinical mission is to provide the best possible medical care to their patients, utilizing advanced diagnostic and therapeutic techniques in a spirit of mutual respect and collaboration with our patients, staff and other medical professionals.